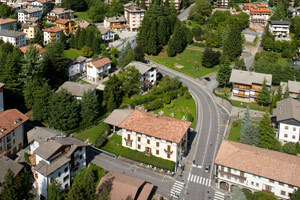 Hotel Ferrari is located in the centre of Bratto in the territory of Castione Della Presolana. The Hotel has always offered its guests the welcoming atmosphere of a private home. The hotel has been run by the Castellani family for over 40 years, attention to detail and a warm welcome, as always, characterise the hotel, allowing guests to enjoy an unforgettable holiday. The ideal place in which to relax, just a few kilometres from the city. Hotel Ferrari, three strars, is located in a panoramic area, ideal for long walks and close to shopping areas while a few minutes’ drive will take nature lovers into a beautiful natural environment. The private internal garden is the perfect place in which to rest and relax in the sunshine or shade. Hotel Ferrari also has a large private parking area.